Workouts continued this week at the Paul Owens Training Facility at the Carpenter Complex, the official name for the facility. Now you see why I and others always refer to it as the Carpenter Complex or just the Complex. I was on hand on Wednesday and Thursday. The workouts were similar to those I wrote about on Tuesday. 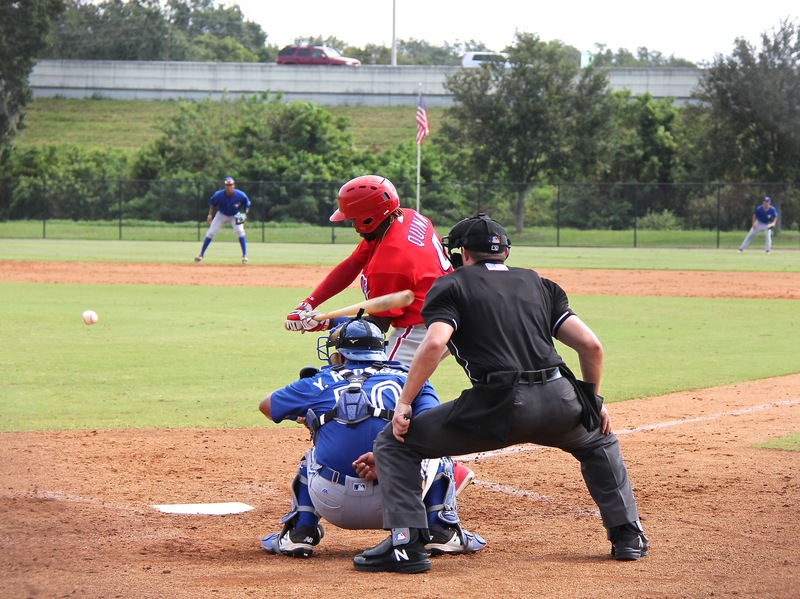 Variations included lateral movement and balls in the sun for the outfielders, bunt defense and the wheel play for PFPs, and rundowns and repetitive infield drills with some guys seeing time at different positions for the infielders. 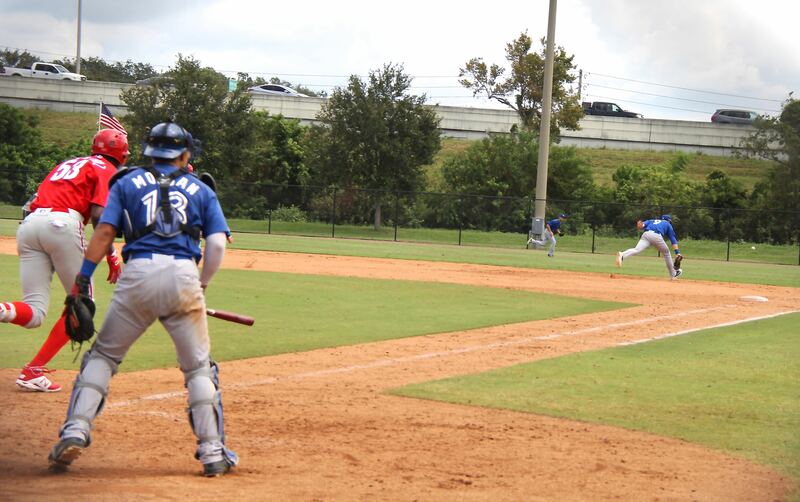 Roberts Field – 1B Pickett/Listi, 2B Gamboa, SS L. Garcia/Guzman, 3B Holmes/Stewart. The middle infielders on Roberts rotated positions. Gamboa covered a lot of ground and made several amazing catches during the drills. During batting practice, I was drawn to the fields that had live pitching rather than the machines and over the course of the two days I watched Mayer, Muzziotti, Carlos De La Cruz, Gurrola, Moniak, Williams, Green, Zoellner, Guthrie, Gonzalez, Maton, Fitch, and Pelletier. 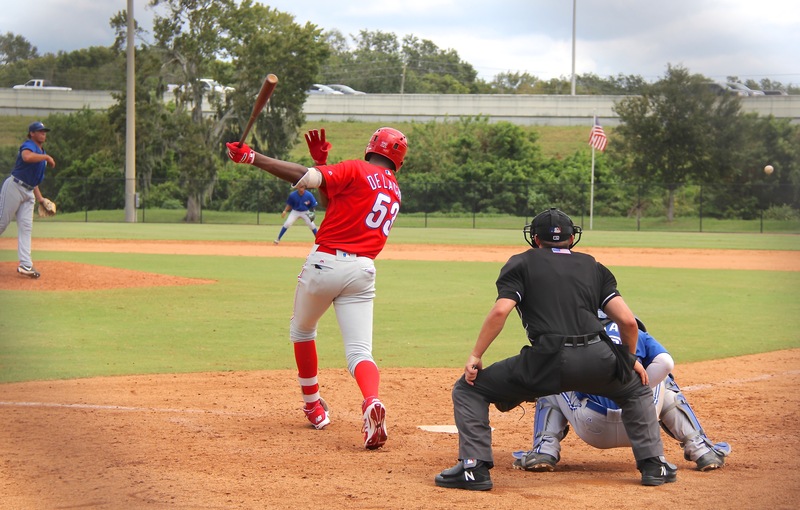 Carlos De La Cruz is interesting because he is 6’8 and 210 pound 17-year old. I watched him bat off a pitching machine one day and he reminded me of Garry Maddox with his wide stance, small bat, and swing/follow through. 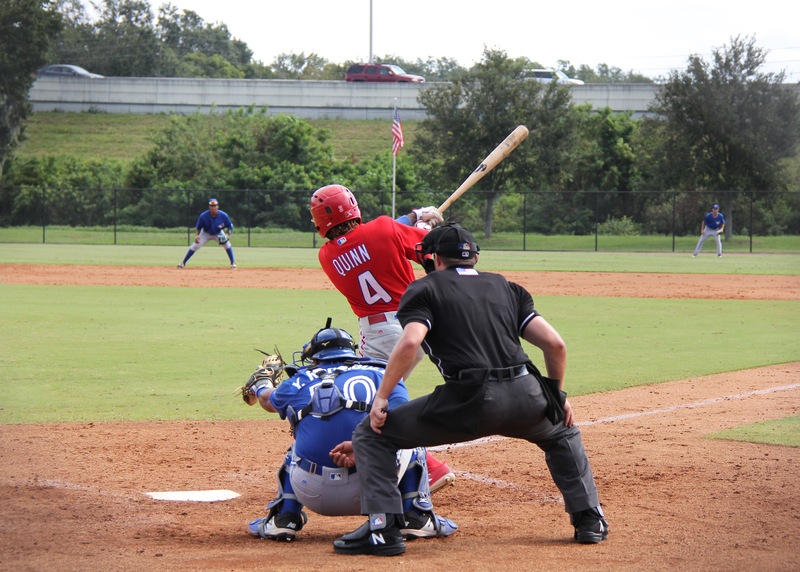 The next day against the machine, he looked more comfortable at the plate, looked like he had a different bat, had a better swing and allowed his back hand to come off the bat on his follow through. He still struggled against the machine but looked better and actually crushed 2 balls over the LF fence. 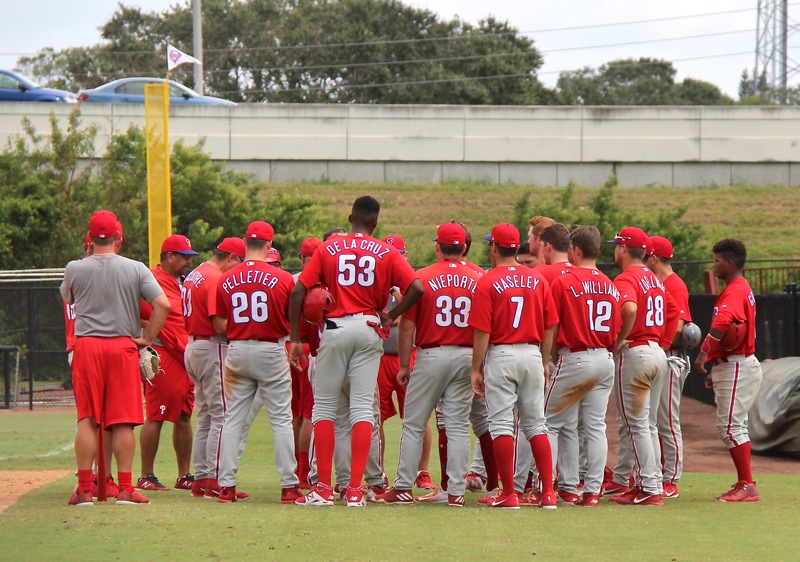 The Phillies have put out an updated roster that does not include 3 players on the one BA released earlier. Addison Russ, Daniel Brito, and Jose Gomez have been left off due to their winter ball commitments. Aaron Brown is on the current list. 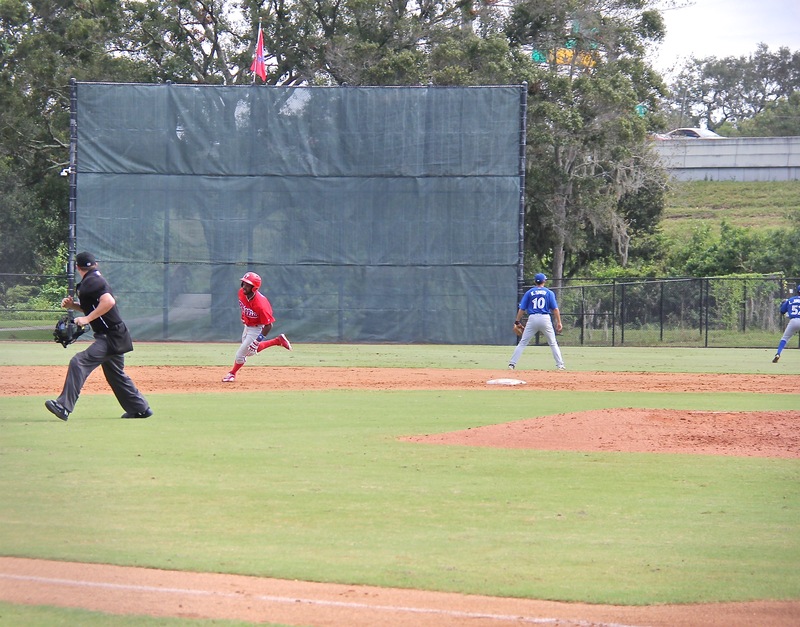 Without Brito and Gomez, there are only 15 infielders at Instructs. 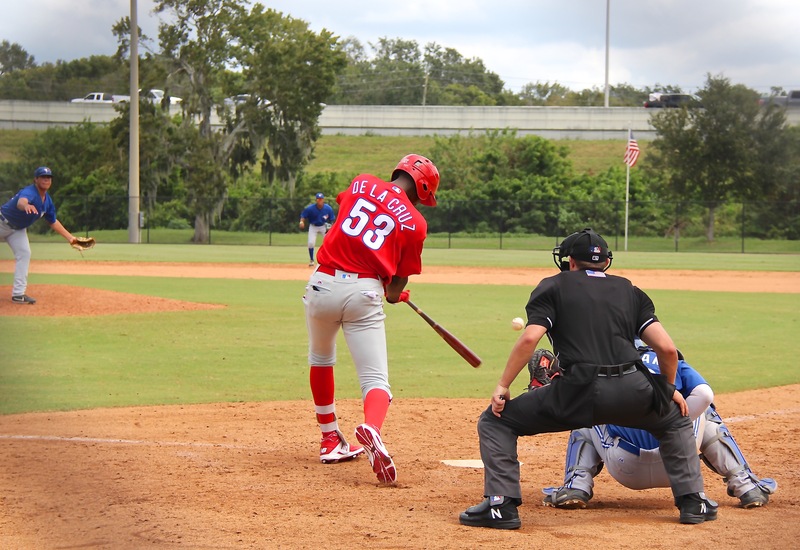 I have seen all players headed to the AFL except Elniery Garcia, but I’m sure he is here somewhere. Add Bailey Cummings and Kevin Gowdy to the list of rehabbers in attendance. Gowdy’s arm is in a brace, I don’t think he is able to do much with it. Note that with Quinn starting in center, Moniak slid over to left. 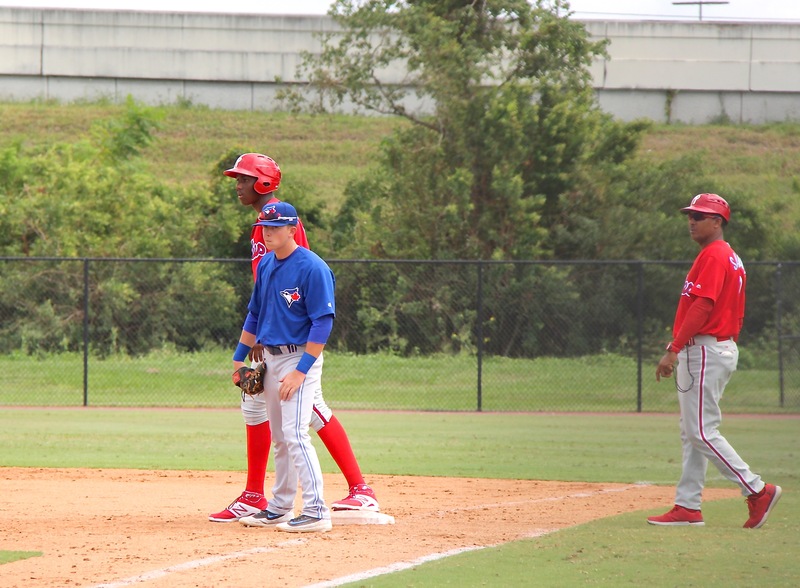 And Williams (who I also saw taking reps at first base earlier in the week) was Moniak’s replacement in left. Here is the 2017 Instructs Schedule. Here are a couple shots from my cell phone of some pitchers during PFPs. From L to R – Aaron Brown, Jake Hernandez, and Kyle Young. 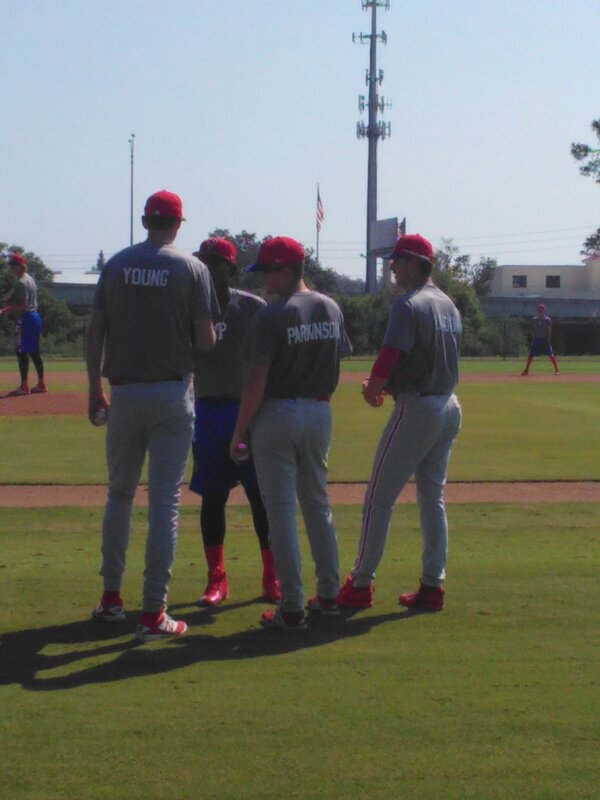 From L to R – Young, Sixto Sanchez, David Parkinson, and Ethan Lindow. Some of the young guys look bigger to me. I haven’t seen them since spring training but Mickey Moniak and Josh Stephen both look bigger across the shoulders than I remember. 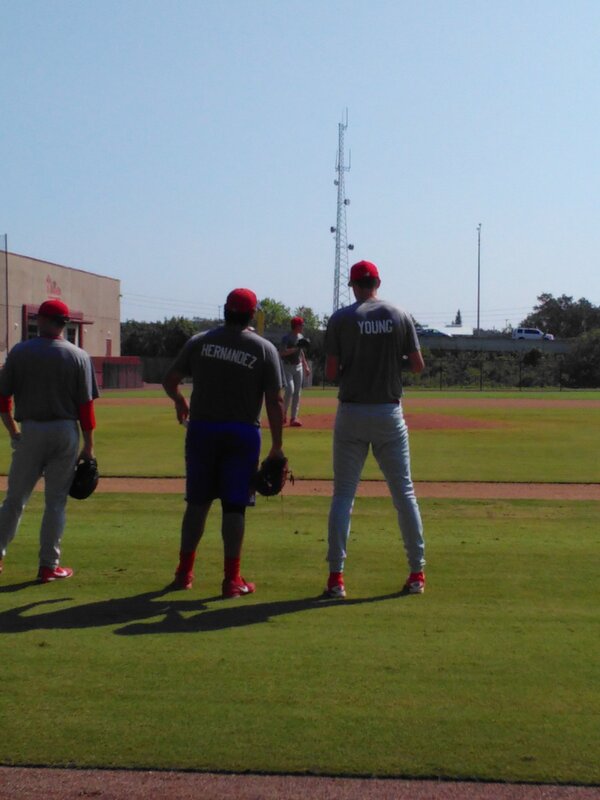 Moniak looks a little thicker in his upper legs too. That’s it for today. Next game on Monday at 1:00 PM at the Complex. I neglected to mention that, keeping in mind that some of the pitchers were working on something (it is Instructs after all) and that some of others were working off the rust prior to reporting the Arizona Fall League, Trevor Bettencourt looked particularly sharp Saturday. Jim … your Gary Maddox swing comp for De La Cruz is a good one. I thought the same thing when I saw the video Romus posted the other day. Also … thanks for including the pic of Jakob Hernandez. It’s the first time I’ve gotten a gander of the Hefty Lefty. His 290 lb listed weight might not be a misprint. The fact that you took the pic of Hernandez standing next to Kyle Young is just too funny. They look like an inverted number 10.